Crisp almond flour biscotti studded with cranberries and pecans and dipped in sugar-free chocolate. 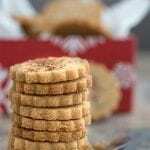 This easy low carb biscotti recipe is a classic holiday treat made keto! Perfect for gift giving or keeping all to yourself. This post is sponsored by Bob’s Red Mill. Well it’s about time I updated this Keto Cranberry Pecan Biscotti! It’s been on my blog since December 2011 and it’s a timeless classic. It was one I first made to share on a friend’s blog, way back in the day. But she shut her blog down a few years ago and the biscotti recipe was almost lost. Thankfully, I was able to dig it up again. I re-made them last year and was happy to find that these almond flour biscotti are just as good as they ever were. 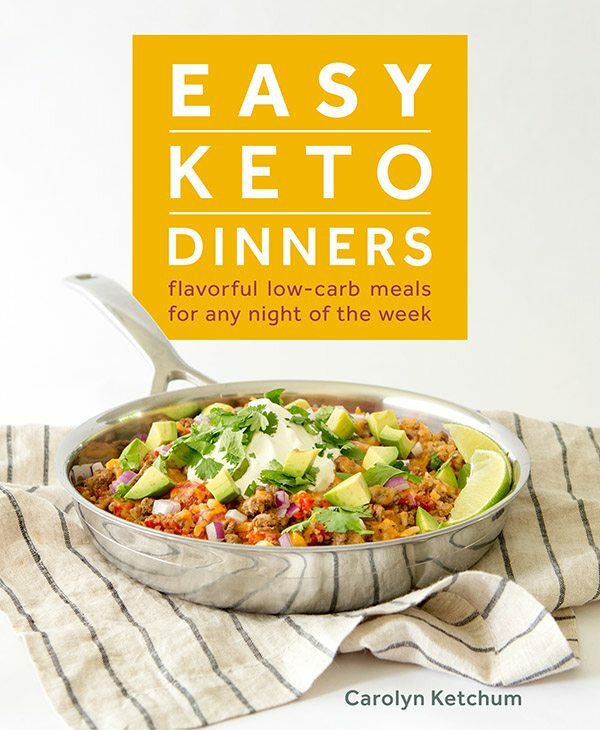 Keto recipes that stand the test of time are my hallmark, if you will. But sometimes I go back to an old recipe and I am not quite sure what to expect. 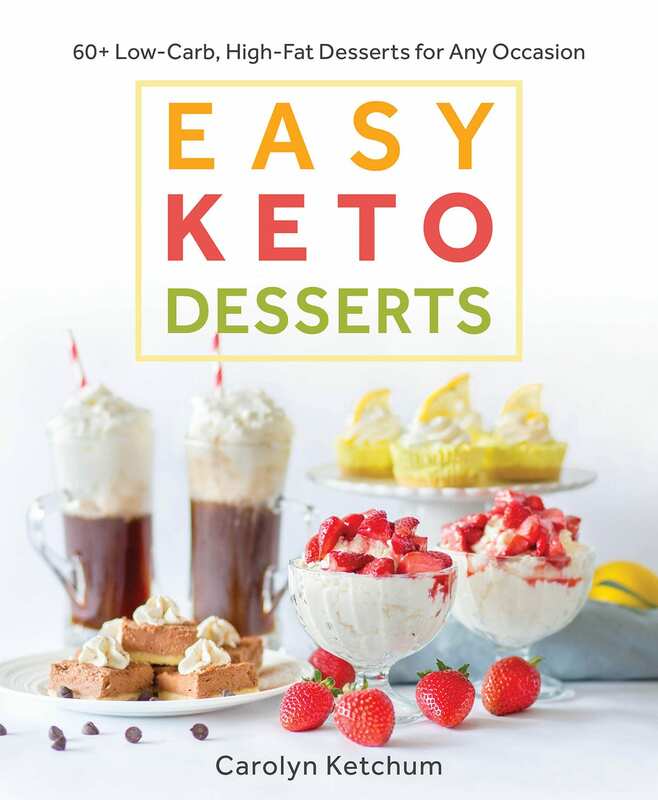 I’ve learned a lot about keto baking in the intervening 7 years and sometimes my older recipes need a bit of work. Not this one, I am happy to say. It was spot on right from the beginning. I grabbed some new photos and figured I would walk you through exactly how to make biscotti for the sugar-free and gluten-free crowd. I’ve made a lot of almond flour biscotti in my day. A lot! Making almond flour biscotti really isn’t very different from making conventional biscotti. The method is the same, baking a log of dough first and then slicing it and re-baking the slices. Done right, you will end up with crisp biscuits that are perfect for dipping into coffee or tea. But there are a few differences. Being gluten free means that these almond flour biscotti are a little more fragile and have to be handled with a bit of care when slicing. 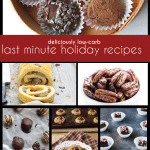 Here are my best tips for making low carb, gluten free biscotti. Be sure to use finely milled almond flour. That goes almost without saying. The finer your flour, the better your biscotti hold together, so try to use good blanched almond flour and not the more coarse almond meal. For all of my biscotti and other keto baked goods, I always use Bob’s Red Mill almond flour. To help it hold together even better, try adding a bit of xanthan gum or 1 tablespoon of coconut flour. The coconut flour helps make the biscotti a little drier, and you want a dry consistency for biscotti. Bob’s Red Mill is my go-to coconut flour as well. If you are adding nuts or cranberries into the mix, be sure to chop them finely before adding. Larger chunks can make it hard to slice the loaf properly. Keep your loaf on the small side, about 4 by 10 inches, so it’s easier to cut. When you cut, you want to gently saw first just to get through that crisp top layer, and then you want to cut straight down. If you saw the whole way through, it tends to make the ends break off. Be patient! Let the biscotti completely dry out in the warm oven. They may still seem a bit soft after the second baking but they will crisp up as they cool. Once they’re baked through, they’re pretty sturdy. You only really need to be gentle with them when you are slicing the logs and when you are flipping them over. I’ve traveled cross country with some of my almond flour biscotti, and I’ve sent them to friends because they hold up so well in transit! 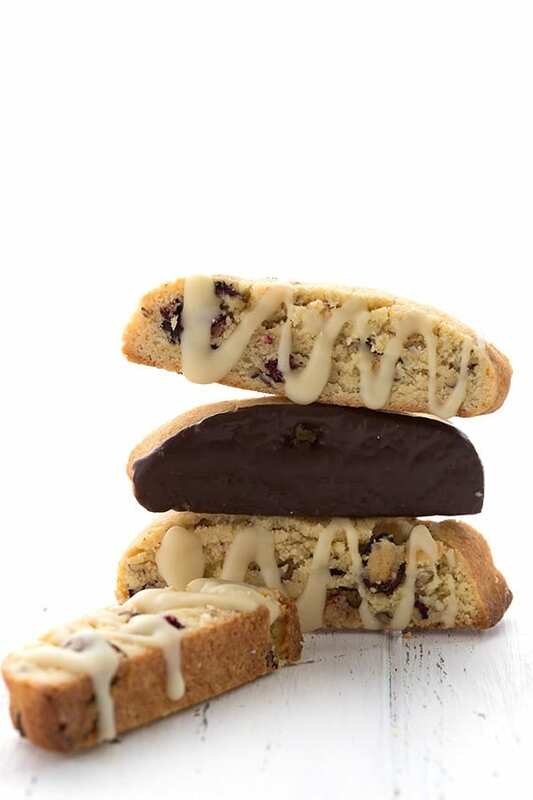 Now you may notice that in my photos, some of these biscotti have a white chocolate drizzle. Sadly, there isn’t a truly good sugar free white chocolate on the market. KZ Clean Eating used to carry a xylitol sweetened one, which is what you see on a few of these almond flour biscotti. But they no longer appear to make it. You can actually make your own low carb white chocolate drizzle with some cocoa butter, some powdered sweetener, and a little vanilla extract. It’s not quite the same but it does give the same appearance and overall taste once it’s on the biscotti. But the dark chocolate dip is my favorite anyway, and goes so well with the cranberries and pecans. All I do is melt some Lily’s Dark Chocolate with a bit of cocoa butter so it melts more smoothly. Then I dip, you dip, we dip! 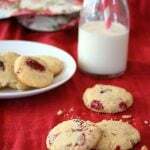 And it’s a perfect use for my homemade Sugar Free Dried Cranberries too! Low carb almond flour biscotti studded with cranberries and pecans. 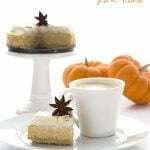 A perfect sugar free and gluten free treat! In a large bowl, whisk together almond flour, Swerve, baking powder and xanthan gum. Stir in orange zest. Stir together melted butter, egg, and vanilla extract until dough comes together. Add pecans and dried cranberries and stir until mixed throughout. In microwave or double boiler, melt chocolate until smooth. Dip ends of biscotti in and lay on a waxed paper lined baking sheet until set (you can chill them to set the chocolate faster). Many Thanks to Bob’s Red Mill for partnering with me to bring you this post. 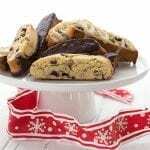 These are definitely festive biscotti – been thinking of making some as my kids love biscotti. DELISH!!!! 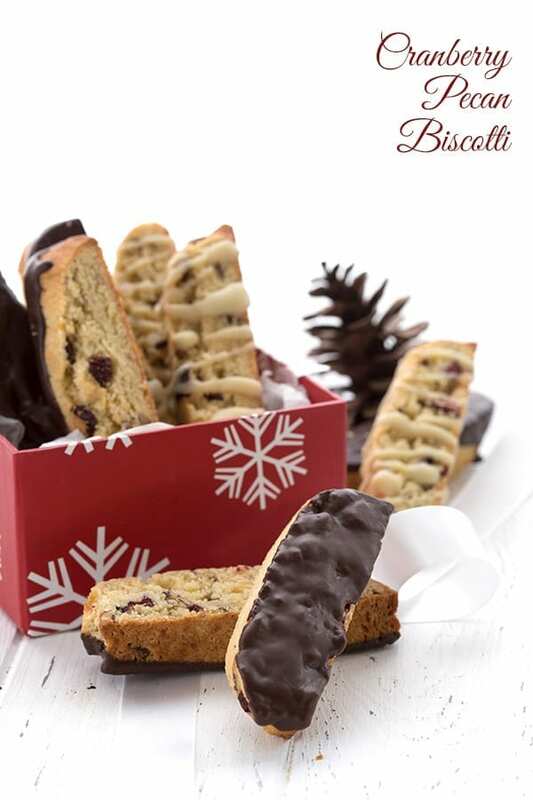 I adore cranberry biscotti…and these look amazing dipped in chocolate!!! More cranberries please! I love those biscotti. Ooo – stunning – would love to sit now for a cuppa cuppa with you and these biscotti. Yummy! Cranberry and chocolate heaven. Those looks delicious! Biscotti is pretty cool, maybe I'll try to hang with it and make some! I love the chocolate coating!! I'm jealous of your biscotti baking skills. Everytime I try biscotti they come out all crumbly…I've given up on making them in my kitchen. But these look fantastic! Heading over to check these out. 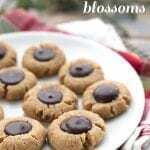 May be another perfect recipe to bring for my mom for Christmas! I worked some hefty magic and made a whole lot of them disappear in a matter of a few days! These biscotti look so delicious! Love the flavors! I don't think I have ever had cranberry biscotti, they look goregous!! 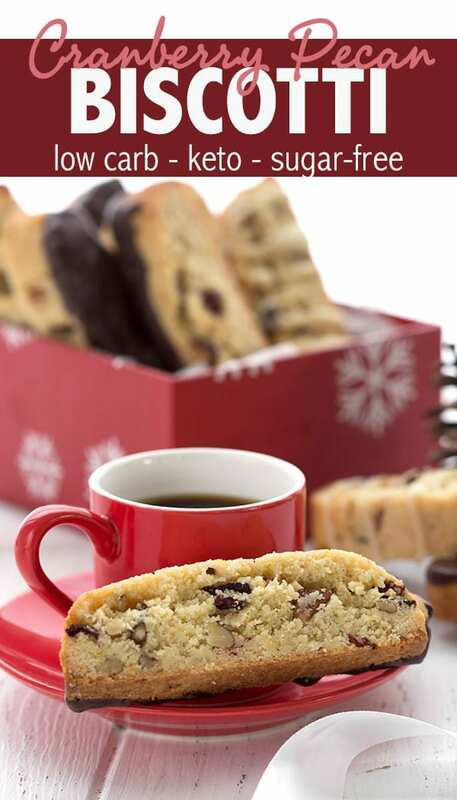 I love this idea – cranberry in biscotti seems like a wonderful combination. Lovely – I haven't made biscotti in ages. Sounds wonderful. I love biscotti! This looks amazing. I've only made biscotti once before, but now I am so inspired. YUM Carolyn! I love biscotti…so beautiful! Love this recipe. Your comment that the holidays were invented just so we all had an excuse to eat more chocolate is hysterical. I go into a food coma every holiday but I'm not complaining. I enjoy dipping biscotti into my morning cup of tea. I bet these would taste great alone or with some tea. Thanks, Wendy. 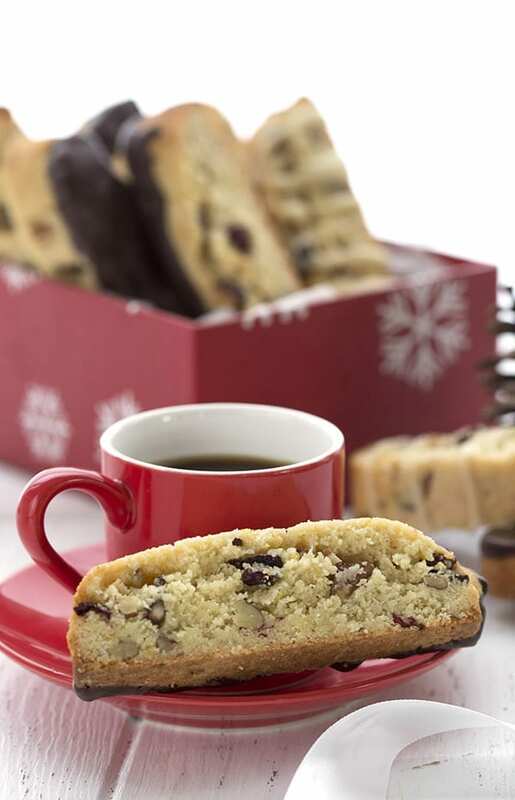 Wish we could share a few biscotti dipped in our favourite hot drink (coffee, for me). these look deliciously good! perfect wit that cup of tea or coffee! Having you guest post was a pleasure!!! 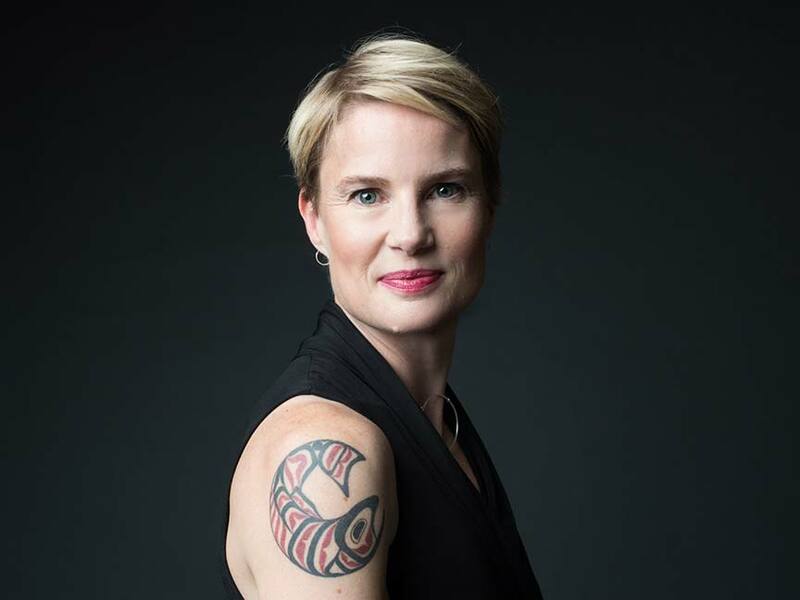 Thank you so much, Carolyn! 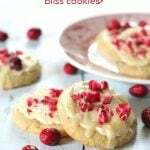 These are bookmarked for an honored place in my “13 cookies of Noël” platter I make every year come holiday-time…These would be sheer bliss dipped in a high-quality, vanilla bean flecked white chocolate! !..Thank you for your inspiration! Also…would you or your readers know of a place to obtain erythritol in France at a decent price?…This ingredient CAN be found in one local store close to me…but in a very small format and somewhat pricey…It is so crucial to the success of many of your offerings…Thank you in advance for any enlightenment! I don’t know of where to purchase erythritol in France, although I know it must be possible since the erythritol Swerve uses is made n France! Is it available online in France anywhere? Do you have/post the nutrition info on these anywhere? 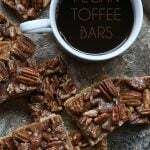 help – I can’t access the link to the recipe and would like to make these for a coffee I’m hosting this week! 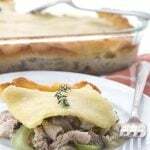 Is the recipe posted anywhere else, other than the budgetgourmetmom website? Thanks! Leave out the orange zest and the cardamom, add 1/4 cup finely chopped pecans and 1/4 cup chopped sugar-free dried cranberries. Then melt about 3 ounces dark sugar-free chocolate for dipping once they are cool. 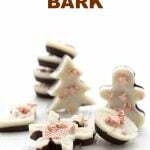 Hi, I was wondering if these can be frozen (and at what stage) so I can pre-make them before the xmas rush? Thanks! These were wonderful! After baking them the second time, I put them in my dehydrator for about 12 hours. Everyone loved them. Delicious! 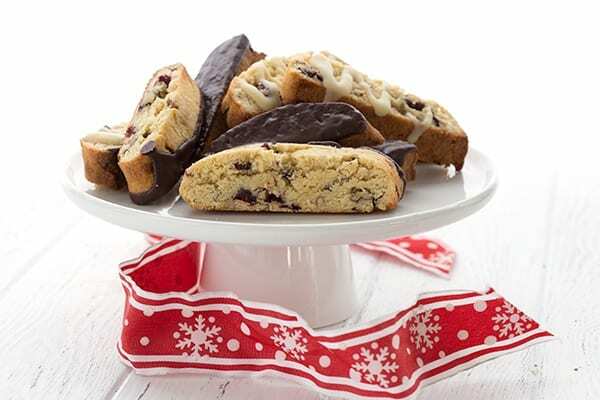 I love biscotti and this cranberry pecan sounds amazing! Can you use powered Stevia for these? Probably but I haven’t tested it. Yes! this is the best recipe for this on the interenet. So good. Oh wow, I love that this is low carb. I’ve never baked with almond flour or even knew it existed actually. 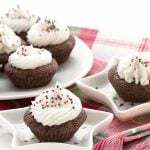 I’m going to try to bake these for my holiday ladies group party. These are absolutely perfect — so great with a cup of coffee! 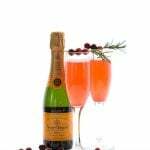 I just made this recipe for the first time yesterday, and I have to say that it is fabulous! I used the coconut flour version instead of xanthan gum and added 2 drops of Boyagian orange oil to the dough to boost up the orange flavor. I drizzled it a glaze that I made with powdered xylitol, cream, vanilla and orange extract, and I put a few rehydrated cranberries on top for a festive look. They are a wonderful with coffee on these cold holiday mornings! Would it work to cut the dough before baking the first time? I thought I could cut or score but not separate before 1st bake then “cut” again to bake for the second time. I don’t think so. It’s pretty soft at that point. But you can give it a try if you like. 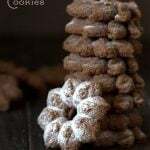 I am looking to make Italian pepper biscuit I was wondering if you think the texture of these would work if I make them savory and leave the sweetness out or if you have another recipe you think would work better. I am wondering if a fat head kind of dough may work maybe slicing and re baking. 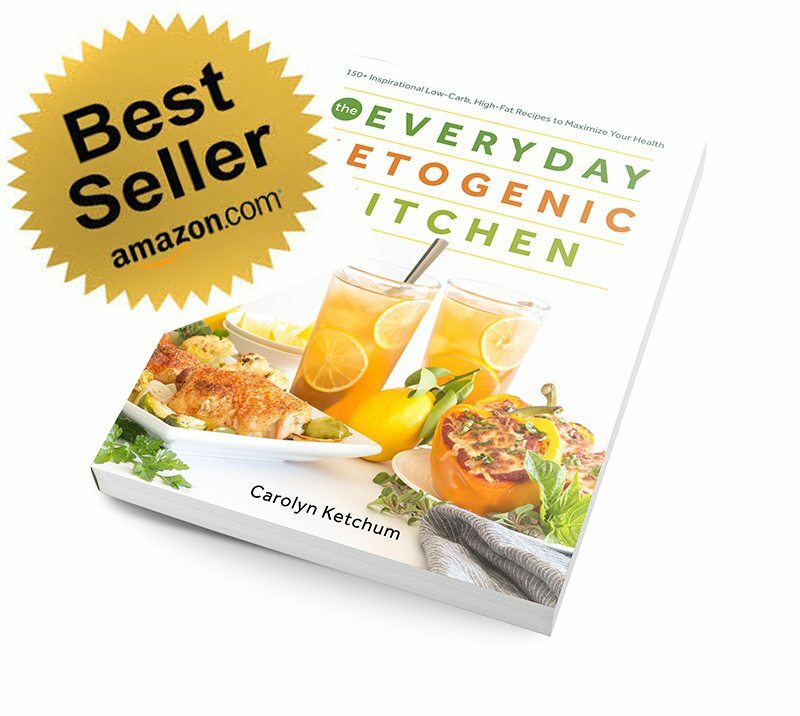 Thank you in advance your recipes are great. HI Beth, I don’t think fathead would work that well here but this might be what you’re looking for. It will be fine without sweetener. I made these day before yesterday and they are fantastic. They need a little time to harden, and they keep very well. Thanks for another great recipe!